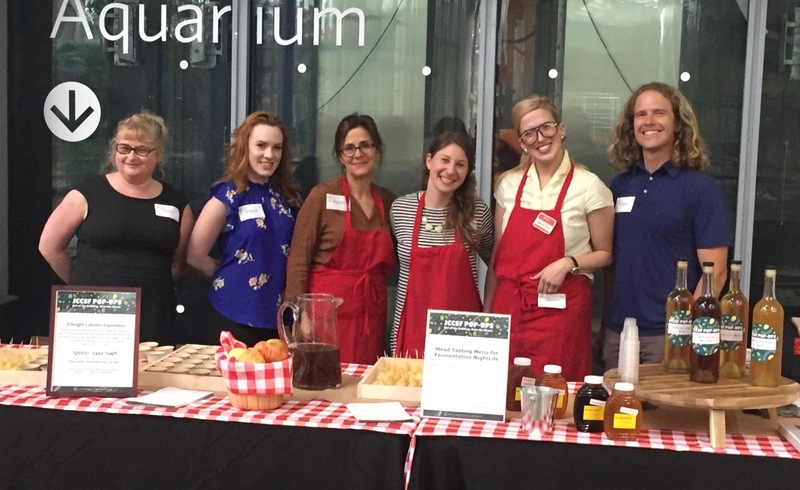 I had the pleasure of partnering with the JCCSF and the California Academy of Sciences How To: Fermentation NightLife series to do a sauerkraut demonstration and serve fermented apples and honey on September 7th, 2017. If you’re seeking some new recipes and new traditions for Rosh Hashanah, the Jewish new year, you have come to the right place. Thoroughly clean and dry a 1-gallon sized ceramic crock (there could be one in your slow cooker) or a food-grade plastic bucket. Measure out the salt into a small dish. 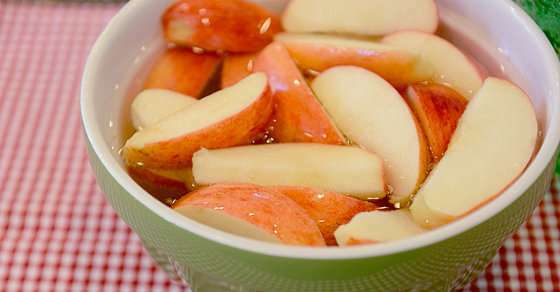 Scatter a small pinch of the salt onto the bottom of the crock, then add the apples, pressing them into a flat layer. Scatter another 1/4 teaspoon or so of salt evenly over the top, then sprinkle on the caraway, then the onion. Press the onion into a flat, even layer, the scatter on some more salt. Start adding the cabbage a little at a time, punching it down firmly and layering it with the salt. Reserve about 2 teaspoons of the salt for later. Using your fist or a blunt implement – the edge of a rolling pin, a meat tenderizer, the handle of a hammer wrapped in plastic to keep it clean – to bruise the cabbage by stabbing it all over in an up-and-down motion. This takes about 10 minutes or so, so be patient, and take pleasure in working out your frustrations! You want to decrease the volume of the bucket by at least one-third. And, most importantly, you want to make sure the cabbage is very wet and juicy at the surface when pressed. Flatten out the surface of the cabbage and use your hands to scrape any vegetables from the side of the bucket. Sprinkle the remaining salt over the top, especially around the edges. Place a sheet of plastic wrap over the kraut – it’s very important for the plastic to be loose and away from the edges by about 1/4-inch. Cover the plastic wrap with a flat plate or lid to cover the surface almost entirely, but that does not touch the sides. Place a 1-2 pound weight on top of the plate, such as some large river rocks or a pint jar filled with water. Cover the crock with cheesecloth or a thin, cotton kitchen towel, securing it around the crock, to let air flow in but to keep out insects and debris. Keep the crock in a cool place away from direct sunlight. Check it the next day; the surface should be wet and juicy when you press down on the weight. (And if it’s not, bruise it some more until it is.) The kraut should sit at least a week, but the longer it sits, the more fermented it will become. Be sure to check at least every other day to make sure the surface remains moist and mold-free. If you do find small amounts of white mold, simply scoop it away and discard it. The kraut is ready when you like the aroma; it will smell pleasantly fermented and kraut-y. Once it’s ready, stir the kraut thoroughly from top to bottom before eating. Store your kraut in the refrigerator packed down tightly with all vegetables scraped away from the sides, either in the bucket you used to ferment it or spooned into clean jars with tight-fitting lids. Make sure to store the kraut with its juice; it will help to preserve the pickle. The kraut will keep for weeks or months if properly stored, but it will continue to ferment slowly and evolve as it stores. Wash and dry the apples, cut them into 8 half-moons, and cut away the core. 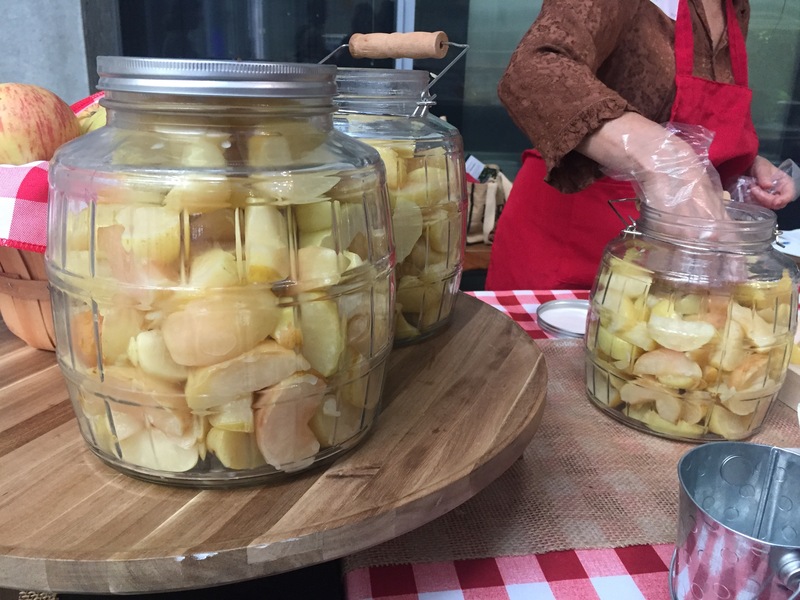 In a clean, crack-free glass jar, ceramic crock, or food-safe plastic container, pack the apples tightly in the sauerkraut. Start with a small layer of kraut on the bottom, then a single layer of apples, more kraut, more apples, etc., and top it with a very thick layer of kraut – you shouldn’t see any apples peaking through, and the kraut should cover the entire surface evenly. Pack the apples and kraut down very tightly, and add more kraut if needed. Keep the crock in a cool place away from direct sunlight. Check it the next day; the surface should be wet and juicy when you press down on the weight. (And if it’s not, add more kraut to keep it wet.) The apples should sit at least a week; the longer they sit, the more fermented they will become. Be sure to check at least every other day to make sure the surface remains moist and mold-free. If you do find small amounts of white mold, simply scoop it away and discard it, then add more fresh kraut in its place. The apples (and kraut) are ready to eat when you like the flavor. Keep them stored, covered loosely, in the refrigerator, and eat within a week. In a small clean, odor-free glass jar, stir together the honey and the water, and cover the jar loosely with secured cheesecloth. You want to let in air but keep out insects and debris. Place the jar in a clean, well-protected, low-light area with an ambient temperature of 60 to 68 degrees Fahrenheit (16 to 20 degrees Celsius) for 2 weeks. Stir the contents once daily just until the honey starts to sour very slightly. 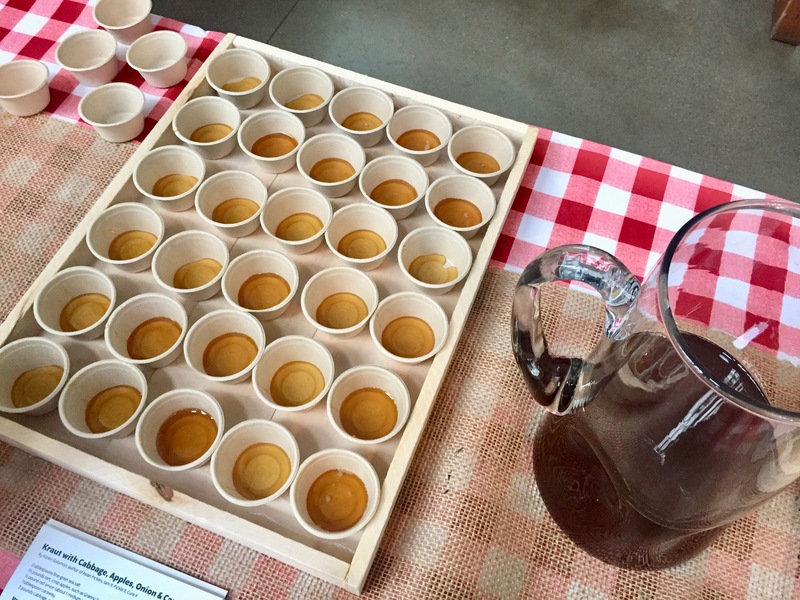 The flavor will be subtle when the honey is finished fermenting. Cap the jar tightly and refrigerate it for up to 1 year. Use this honey anywhere you would use room temperature honey.